Transparency market Research (TMR) notes that the global ophthalmic lasers market is categorized by the presence of several large and small players operating in it. The rivalry between the players is likely to increase as they aim at offering technologically advanced products in the field of ophthalmology. Among the multiple strategies adopted by players in the global ophthalmic lasers market to stay ahead of the competition, product innovation has paid off the most. The global ophthalmic lasers market is expected to grow steadily due to the existence of large players who are investing in innovative branding ideas. Some of the leading players in the global ophthalmic lasers market are Carl Zeiss, Novartis AG, Ziemer Ophthalmic, IRIDEX Corp, Ellex Medical Lasers, and Abbott Laboratories. The TMR report projects the global ophthalmic lasers market to register a promising CAGR of 4.60% from 2016 to 2024. By the end of 2024, the market will be worth US$1.44bn, predicts the report. Out of the various end users, the demand from ophthalmic clinics is expected to remain high in the next few years due to their outstanding expansion rate and patient’s preference for visiting the specialists for lasers treatment procedures. Region wise, North America is expected to lead the global ophthalmic lasers market in the coming years. This is attributed to flourishing healthcare infrastructure and regulatory structure in the region. The ophthalmic laser is a medical device used in targeting ophthalmic cells in order to operate ophthalmic disorders. An ophthalmic laser is a perfect tool for certain therapeutic procedures and clinical diagnosis procedures. This device is extensively used in various ophthalmic disorder procedures such as laser trabeculoplasty, cataract surgery, retinal photocoagulation, laser iridotomy, and posterior capsulotomy. 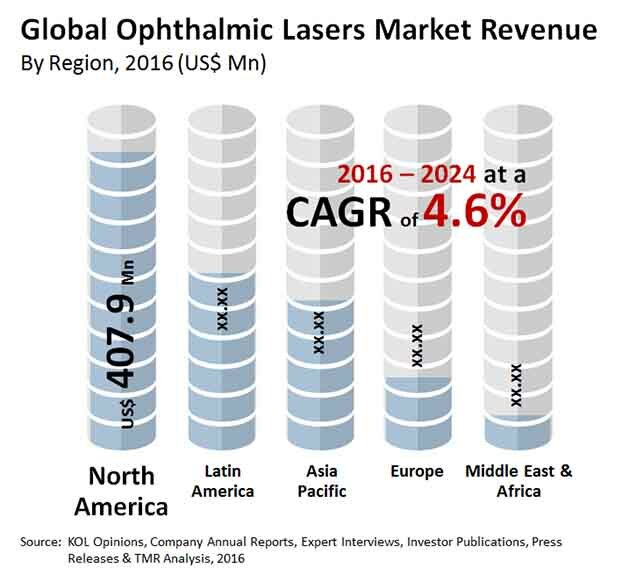 Rising number of patients suffering from various eye diseases, increasing awareness about productive medical care and timely diagnosis, and growing demand for effective eye treatments are factors driving the global ophthalmic lasers market. Patients are preferring ophthalmic lasers treatment due to the easy availability on an outpatient basis and pain free procedures. Furthermore, increasing cases of chronic disorders such as diabetes, rapid technological advancement in the field of ophthalmology, and burgeoning population are fueling growth in the global ophthalmic lasers market. The incorporation of technologies in the ophthalmology enhances the accuracy of ophthalmic laser surgeries. For instance, technological progression in ophthalmology such as optical coherence tomography helps in identifying retinal diseases through quantitative data. Such data aid in evaluating retinal abnormalities. Growing initiatives for treatment of vision impairment, and rising regulatory approvals for new products are propelling the global ophthalmic lasers market. Rising preference of alternative treatments over the ophthalmic lasers due to their easy availability is one of the main challenges the global ophthalmic lasers market needs to overcome. Apart from that, the high cost of equipment and therapy is also negatively impacting the market. Nevertheless, the growing support from government for creating consumer awareness will help underpin growth momentum in the next couple of years. The study presented here is based on a report by Transparency market research titled “Ophthalmic Lasers Market (Product - Diode Lasers, Femtosecond Lasers, Excimer Lasers, Nd:YAG Lasers, Argon Lasers, and SLT Lasers; Application - Glaucoma, Cataract, Refractive Error Corrections, Diabetic Retinopathy, and AMD; End User - Hospitals, Ambulatory Surgical Centers, and Ophthalmic Clinics) - Global Industry Analysis, Size, Share, Volume, Growth, Trends, and Forecast 2016 – 2024”.